Trout is a freshwater fish that is a favorite of many anglers for both its fighting ability and mildly sweet flavor. Rainbow trout and speckled trout are just two of many types of trout you can find in rivers and lakes. 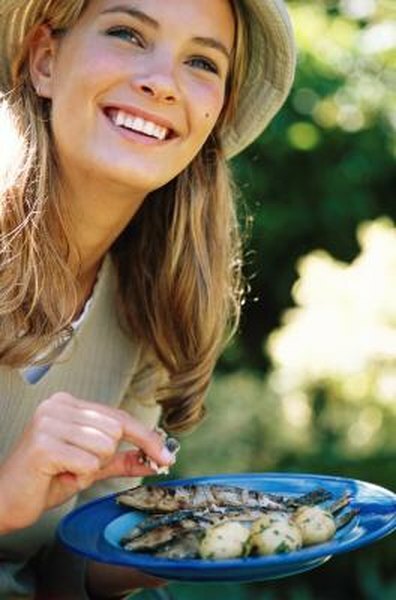 Fresh trout is high in protein and rich in heart-healthy unsaturated fatty acids. Like other fatty fish, trout is well-suited for grilling. Wipe the grates with a clean cloth soaked in olive oil and then turn up the grill to medium heat. Season the trout with salt, pepper, lemon or olive oil to suit your taste. Place the fillet on the grill flesh-side down if it still has its skin. Grill the trout for about 2 minutes. Turn the fillet over with a spatula, and grill it for another two minutes. Continue flipping every two minutes until the fish becomes opaque and flakes easily. Total grilling time for a fillet that's less than an inch thick is 6 to 8 minutes; thicker fillets require slightly more time. Remove the fish from the grill and serve. Tear off a large square of aluminum foil for your fillet. Center the trout on the foil. Squeeze lemon juice over the fish and sprinkle minced onion, freshly pressed garlic or any other additional ingredients on and around the fillet. Crimp two opposing sides of foil together over the fish, then roll the top of the package down toward the fish to seal it. Crimp the openings at each end and roll them in toward the fish. Place the packet on your grill and let it cook for about five minutes, turning half way. Remove the packets from the grill, open them carefully and serve.